The Peterborough Panthers team for 2017. From the left they are, back, Bradley Wilson-Dean, Simon Lambert, Ulrich Ostergaard, Jack Holder, Kenneth Hansen, front, Paul Starke and Tom Bacon. 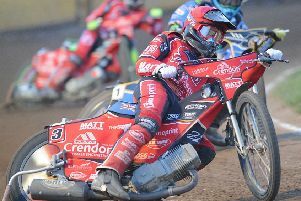 Peterborough Panthers have five new riders in their 2017 line-up. Hoping to become a magnificent seven are . . . The younger brother of a world champion and a seriously hot prospect in his own right. Fourth in the World Under 21 Championship last season and tipped to star in his first Panthers season. The ‘old man’ of the team, but he insists he’s as hungry as ever. Elite League title-winner with the club in 2006 and second-tier riders’ champion in 2015. Skippers Panthers for a fourth successive season. It’s the year of the sporting comeback in Peterborough. First there was CMS at Posh, and now crowd-pleaser Hansen returns to Panthers. A star for them in 2009, he’s now a classy 2017 addition. A trophy-magnet who has helped teams to league title honours at three levels in the last four years. Was a star of the double-winning Somerset side which dominated the second tier last term. Panthers will be praying he dodges the serious injuries of the last two seasons. The Lincolnshire lad is capable of racking up big scores home and away, whether at reserve or second-string. A double-winner with Somerset last season, a national title winner during the winter, and a new Panthers signing expected to play a pivotal role in 2017. Best reserve in the Championship. Steps up to SGB Championship level in just his third season of racing. Has turned professional during the winter after giving up a good job to chase glory on the shale. Another new face.